MOFA – January 24, 2017- Foreign Minister, the Hon. Mark Brantley, is currently in Punta Cana, Dominican Republic leading the St. Kitts and Nevis delegation, at the V Summit of Heads of State and Government of the Community of Latin American and Caribbean States (CELAC). 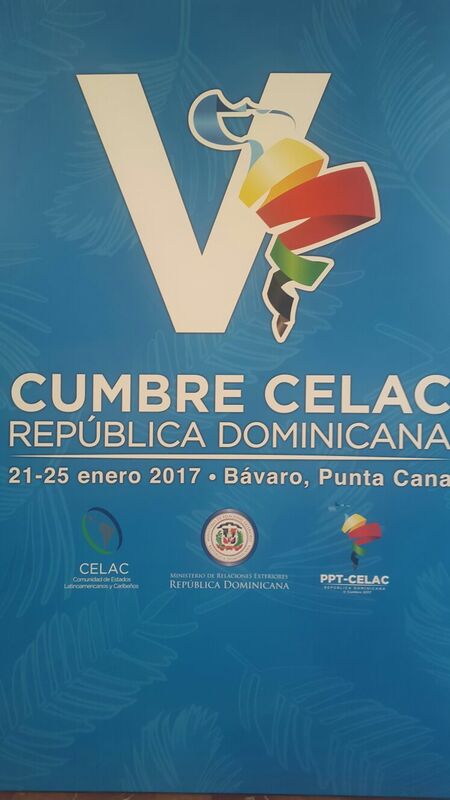 Minister Brantley will also participate in the XIII Meeting of the Ministers of Foreign Affairs of CELAC while in Punta Cana. The January 21- 25 Summit, will bring together high level officials from the thirty-three (33) countries within the CELAC community. The Summit will approve the Political Declaration of Punta Cana, as well as the 2017 CELAC Action Plan of Action which will guide the work for 2017 and determine the areas that should be given priority during the term. Several special declarations submitted by member states are also on the table for approval by the august body. Some of the these declarations include topics related to Sustainable Health Systems, the Inclusion of CELAC member states on lists of Non-Cooperative Jurisdictions, the Implementation of the 2030 Agenda and Sustainable Development Goals, the CELAC Plan for Food Security, Nutrition and Hunger Eradication 2025, Migration and Development, Financing for Development, Gender/Women Advancement, The need to put an end to the Economic, Commercial and Financial Blockade imposed by the US against Cuba and the World Drug Problem amongst others. The V CELAC Summit culminates the one year Presidency Pro Tempore (PPT) of the Government of the Dominican Republic and the PPT will be transferred to the Republic of El Salvador at this Summit. The Foreign Minister is accompanied by Permanent Secretary in the Ministry of Foreign Affairs, Ms. Kaye Bass and Foreign Service Officer, Ms. Sonia Boddie.